John Marks recorded his 481st win in a 5-4 shootout victory over the Florida Everblades. Perhaps it was only fitting that John Marks leapt past John Brophy in the record books on Feb. 29. 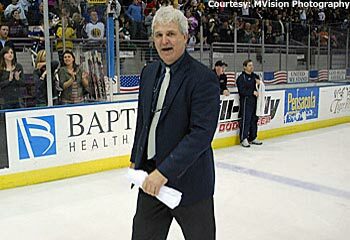 The Pensacola Ice Pilots' coach recorded his 481st win on that special night in a 5-4 shootout victory over the Florida Everblades to become the ECHL's all-time winningest coach. 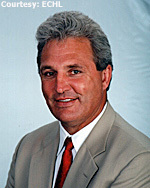 Marks first joined the league as coach of the Charlotte Checkers in 1993 and has spent all but one season in the ECHL since. That special win over the Everblades has been one of the few bright spots for Marks this season, as his Ice Pilots currently reside in last place in the South Division at 16-34-7. Marks has since picked up win No. 482, a 3-2 shootout victory over Florida on March 1. "It's special," Marks told NHL.com this week. "Hopefully I can win a few more games here this year. Records are made to be broken, but someone's going to have to hang around in the ECHL for a long time to do it. That was kind of proven by Brophy, and now by myself." Despite the Ice Pilots' struggles, Marks says his team is still thinking playoffs. Pensacola begins a tough three-game series in Texas tonight. The Wildcatters have the best record in the ECHL at 44-6-9. "Certainly, our plan was to be winning a few more games earlier (in the season)," Marks said. "We'd like to be more in the hunt, or in the middle of the pack. As nice as it is to set a record, it's kind of an anti-climatic sort of thing right now with where we stand in the standings. I'm very disappointed in where we're sitting right now. We've gone through a lot of stuff, and the team has made some headway. We were 23 points back of a playoff spot, and now we're only 12. We've got three games in hand. Mathematically, we've still got a pretty good shot. We're still clawing away." Marks was proud of the way his team battled for him against the Everblades, as the Ice Pilots were able to record the special victory on home ice. A huge celebration ensued, and rightfully so. The humble coach, though, quickly deflected the bulk of the credit to the hundreds of players he's coached over the years. "It felt good … the guys played hard for me and (Pensacola assistant coach) Phil Russell," said Marks, who skated alongside Russell with the Chicago Blackhawks in the late 1970s. "I'm grateful for that. Anytime coaches have any success, usually you're surrounded by good people. Players are the ones that win, and coaches are pieces to the puzzle. I'm very grateful for every player and every team that I've coached in all these years at this level to help with this accomplishment." One of those players is ECHL Hall-of-Fame goaltender Nick Vitucci, who was also Marks' assistant when the Greenville Grrrowl won the Kelly Cup in 2002. Vitucci won a championship as a player for Marks with Charlotte in 1996. "I was fortunate enough to be a part of two championships with him, one as a goalie," Vitucci said. "He's like a kid in a candy store when you win a championship. He's as excited and energetic as the players are. He's somebody you look up to, but he's also a kid at heart. I have a lot of special moments with John personally, just because we've been together so long. He's almost like a father figure to me, as well as a best friend." Vitucci, who will coach the Toledo Walleye when they begin play in the ECHL in 2009, had the pleasure to play for both Marks and Brophy, as he played for the latter in Hampton Roads in 1992-93. Vitucci believes Marks' record-breaking win will also open some eyes regarding Brophy's accomplishments as a coach. The 74-year-old Brophy last coached in 2002-03 with the Wheeling Nailers. "Obviously, records are made to be broken," Vitucci said. "I think it shows what John has done in his career and how successful he's been at this level. From Broph's standpoint, it brings him back to the forefront for people who maybe didn't know a lot about him. I love when records are broken, just because you're not forgetting the person whose record was just broken. You're educating a lot of the public." While the championships stand out as Marks' favorite moments in the ECHL, the Ice Pilots' coach fondly remembers a 21-round shootout with the Checkers during the 1995-96 season against the Roanoke Express. He reflected on it as if it took place last night. "There was a game back in my Charlotte days where we were down 2-0 with about three minutes to play against Roanoke," Marks said. "Shawn Wheeler scored to make it 2-1, and we pulled our goalie and Shawn Wheeler scored again to tie the game up. We ended up going to a shootout. Matt DelGuidice was Roanoke's goalie, and Nick Vitucci was our goalie. The shootout went 42 shooters -- 21 apiece. Our fifth shooter tied it at one each, their seventh shooter scored, and our seventh shooter scored to tie it. It went from seven up to 21. "Our 21st shooter -- Shawn Wheeler -- scored to win the game. That was such an exciting and exhausting shootout as you're ever going to see. To come from down 2-0 with about three minutes to go and end up winning it in that length of a shootout was really an exciting time." Vitucci was asked if he remembered that memorable night. "Matt DelGuidice," he laughed. "Wow, he remembered that?" Indeed he did. He also remembers some of the top players he's coached during his career, including Tampa Bay Lightning forward Andre Roy and former Boston Bruins goalie Rob Tallas. "I've had quite a few guys that have gone on and played in the National Hockey League," Marks said. "That's very rewarding. I had Andre Roy in Charlotte, and he's got a Stanley Cup ring from Tampa Bay. Robbie Tallas was just a $400 a week player, and he ended up backing up in Boston. He certainly made some big strides. I've had a lot of good people. There's a young guy that I'll never forget, Andre Bashkirov. He got a little time with Montreal. Him and his partner, Sergei Berdnikov, they came to Charlotte and couldn't speak a word of English. By the end of the season, I had them tutored and they could speak English. Andre ended up going to Montreal, and that was exciting to see." Despite all of the victories and success stories, Marks hasn't coached at the Triple-A level since 1993, when he guided the Indianapolis Ice in the International Hockey League. Four-hundred-eighty-two victories and two championships later in the ECHL, Marks is still hoping to land a job in the American Hockey League. In the meantime, though, he's determined to turn the Ice Pilots around. "I'll be 60 years old March 22nd," Marks said. "I've interviewed for American League jobs in the last three, four, five years. I always finish second to a younger guy. My resume's been better, but I always finish second to a younger guy. Sometimes I think that the people who are interviewing me, maybe because they're younger than I am are a little intimidated that maybe they think I'm after their job. "Would I like to move up? Sure, I would. Absolutely. But we started something now in Pensacola, and now I feel like I owe the organization and the ownership and some of these kids to show we're here to do a good job and get the franchise back on a real winning note. Now, if an offer came that you can't refuse, well … you can't refuse it." Vitucci was asked why he believes Marks hasn't received an AHL job. It truly is the million-dollar question. "I don't know," Vitucci said. "He can coach. I think a lot of people at the higher levels have felt that John might be comfortable in his surroundings. They know he likes to play golf and he liked living in Charlotte and Greenville. I just think a lot of NHL teams figure that he's comfortable and he just wants to ride out his career in the warm weather. But if you talk with John for five minutes, you're going to know that that's the furthest thing from the truth. He wants to keep going and move up the ladder. He has something to give at the higher level, I know he does. "I think if a general manager of an NHL or AHL team sat down for five minutes with John Marks, they wouldn't even think of his age," Vitucci said. "He takes care of himself, he's in great condition. He's kept up with the times of hockey and the systems. He knows how to challenge players, but he does it in a fair way where the players will work for him because they want to and not because they have to." Vitucci believes it's Marks' ability to wear several different hats that has made him so successful. "The one thing that I think people from the outside don't know is that he's one of the fairest coaches that you'll ever meet," Vitucci said. "He can chum around with you, he can play a round of golf with you, he can pat you on the back. But when you're getting patted on the back, you know that about three feet south is your you-know-what, and he can boot you just as easily. He's very emotional as a coach. He doesn't hide anything, and you respect that. I love the man, and I know he loves his players and he's not afraid to tell them that. You want to work so hard for him because you don't want to disappoint him. Anybody who can get that out of their players is a pretty special coach."